Brandy has reignited her feud with Monica after hitting back at trolls who accused her of being self-centred in a tribute post to late mentor Whitney Houston. The 38-year-old singer remembered Whitney on what would have been her 54th birthday on Wednesday (August 9), sharing a collage of pictures of herself with the I Will Always Love You hitmaker on Instagram. "Lord have mercy on my soul!!! Happy Born Day Whitney. You live on in me… I can feel your Spirit inside of me and all around me. My angel, my friend, my fairy God Mother. I love you forever… thank you for trusting me with your torch!! !” she wrote alongside the picture. "I remember every moment with you and I and will cherish these miraculous moments forever and ever! I love you… 8/9-2/11 #WhitneyHouston." Following the post, which came shortly after Monica's own Instagram tribute, many of Monica's fans took to social media to criticise Brandy for the "self-centred" nature of her letter, with one writing: "Say Whitney Houston's name three times fast and Brandy will appear to tell you about how much she thinks Whitney loved her." However, Brandy wasn't having that, and appeared to blame Monica for the remarks she had been receiving from her fans. "Monica needs to really check her evil a*s fans,” Brandy wrote in the comments on her original Instagram post. "It’s so much stuff I can post about hateful things they say to me... but I will never have time for that. Always thinking something is about her. It’s not!!!! Me and Whitney have nothing to do with anyone but the two of us... we made history and I cared more about being with her than I did with anything else." She then added that Monica should "come get (her) hating a*s pigeons and put them in their place the way (she) did for her when the starz was out of place. They’re low key Brandy fans anyway... always lurking and always creating new pages talking to Me. I’m not to be F**ked with today! If this was rap or hip hop you would be praised for speaking your mind but since it’s rnb you have to take the so called high road... well because I can rap just look at this as my high road." 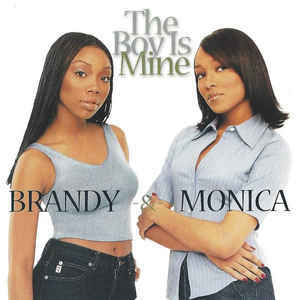 Monica and Brandy, who both took home Grammy awards for their 1998 hit The Boy Is Mine, have been locked in a feud for nearly 20 years, although the reason behind their fallout is not clear.